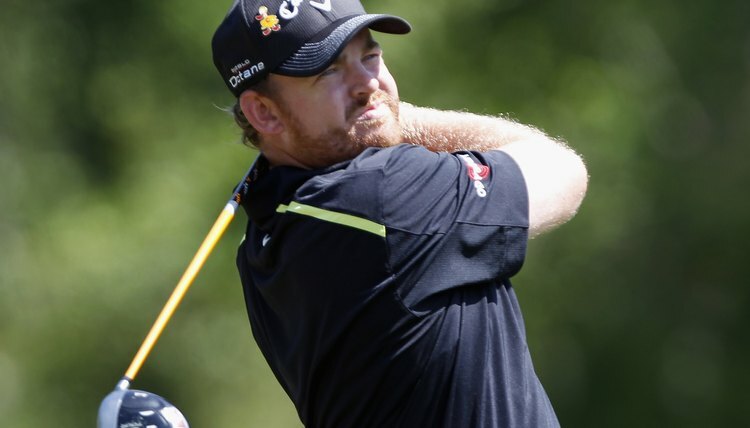 J.B. Holmes was the PGA Tour's longest driver in 2011. PGA Tour golfers are, not surprisingly, capable of hitting the ball farther than average players -- not only off the tee but also with each club in the bag. A pro player is also careful to note how far he can hit each club, so he knows which iron, wood or hybrid to pull from the bag during tournament play. The PGA Tour, meanwhile, keeps a variety of statistics regarding the distances that players typically hit the ball with each club. A 2009 article on the Swingman Golf website listed the average carry (the distance a ball travels in the air) of each club used by PGA Tour players over the previous four years. The statistics are based on the PGA Tour’s Shotlink system, which tracks each shot played on the tour. The average shot hit with a driver carried 260 yards and traveled a total of 287.3 yards, including the roll. An average 3-wood shot carried 238 yards and the average 5-wood carried 223 yards. The typical carry for a 3-iron shot was 203 yards; for a 4-iron 189; for a 5-iron 181; for a 6-iron 169; for a 7-iron 160; for an 8-iron 149; and for a 9-iron 136. The average PGA Tour pitching wedge shot carried 122 yards. According the Leaderboard website, PGA Tour players' average 4-iron shots travel 210 to 220 yards (including the roll). They can hit 5-iron shots 195 to 205 yards; 6-iron shots 180 to 190 yards; 7-iron shots 165 to 180 yards; 8-iron shots 150 to 170 yards; and 9-iron shots 140 to 155 yards. The average distance for a pitching wedge is 130 to 135 yards; for a sand wedge 115 to 120 yards; and for lob wedges 75 to 95 yards. According to 2009 LPGA statistics, the average female professional's driver carries 220 yards and travels 246 total yards. Her 3-, 5- and 7-woods carry 195, 185 and 174 yards, respectively and total 218, 200 and 186 yards. LPGA pros hit 4-irons that total 180 yards; 5-irons 170; 6-irons 159; 7-irons 147; 8-irons 135; and 9-irons 123 yards. Typical pitching wedge shots total 109 yards. J.B. Holmes was the PGA Tour’s longest hitter off the tee in 2011, averaging 306 yards on his tee shots, according to PGA Tour statistics. Dustin Johnson and Bubba Watson were the only other tour players to top the 300-yard mark, as both averaged 302.1 yards on their drives. Their success off the tee, however, didn’t turn any of the three into dominant players. Dustin Johnson tied for 51st among 186 players in scoring average at 70.46 shots per round. Holmes was 55th at 70.52 while Watson tied for 64th at 70.62. The median driving distance average on the PGA Tour in 2011 was 282 yards. PGA Tour players of the early 21st century unquestionably hit the ball farther than throughout the 20th century. A 2003 Golf Digest article noted that the average PGA Tour drive traveled 260.4 yards in 1993, 279.8 yards in 2002 and 287.8 yards in 2003. The article cited golf ball technology as “the biggest reason” for the increase in driving distance.